…The propaganda techniques used to control public opinion used in the First World War are much the same as those used for today’s wars. To heighten patriotism and hatred for the enemy. While British propaganda lured America into the second world war American leaders soon got the hang of it. Propaganda slid seamlessly from war-use to business-use after the first world war. The same technique that was used to get the population to hate the “Hun”, was used to encourage women to smoke, allow corrupt politics, create endless consumption, stoke racism, and create imperialist America. The old British empire where masters of propaganda, but the US took it to a new level. Propaganda should be in the school curriculum, along side business studies as our children are subjected to massive propaganda campaigns every day of their lives. Surely this should be part of the education process as the influence of business in education already is? Considering the amount of billions spent on propaganda (public relations) and the impact it has on our lives, there is very little in the way of critical literature on this topic. 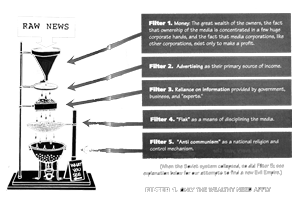 Filter 1.The great wealth of the owners, the fact that ownership of the media is concentrated in a few huge corporate hands and the fact that media corporations, like other corporations, exist only to make profit. Filter 4. “Flack”” as a means of disciplining the media.